“In the summer of 2015 I studied in Rome, Italy, through the John Cabot University program. While there, I took a course titled, “Rome: Modern City,” and learned a lot more about Italian culture and Rome than I ever thought I would. Every week we met our professor in a different location in Rome and learned about its history and the people. Having class and studying in different neighborhoods showed us how, even though every neighborhood has a different story and history, they all piece together to make up Rome. Studying abroad was an amazing experience and I was able to travel to so many places. My friends and I visited Florence, Tuscany, Positano, Capri and Croatia. 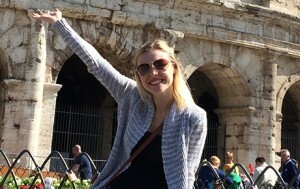 Studying abroad inspired me to keep traveling in the future and to keep learning about all of the different cultures in the world.” – Carly Schaublin ’16 graduated with a degree in Business Administration with a concentration in Management.